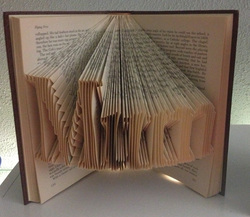 Creating gorgeous gifts out of old books. Sorry I have been a little quiet lately, I fell off the proverbial horse for a while, but I am back in the swing of things so to speak. Hope you have all been keeping safe, I am now taking orders for Christmas so feel free to get in early to avoid disappointment. What do I get my parents for their anniversary? Its always difficult to buy gifts for your parent or your in-laws, particularly if they are fairly well off. They will often tend to buy things they want, when they want them. Here are a couple of ideas you might not have thought of. 1. A himilayan salt lamp, even the most stubborn scientific brain can feel the energy shift. 2. Something to help an ailment they have, maybe an excersize machine or a latest gadget or similar. 3. Gemstones and crystals can be great, then you can either choose one in the correct stone for the month, the anniversary or each of their birthstones. 4. Books on a favourite topic. 5. Its amazing what handmade items you can find on etsy. 6. Folded book with their wedding date. If you have the money you could get 2 books, each with their names. Thanks so much for your order of one of our folded books, I hope you like it as much as we do. I have included some things as a care guide to ensure you get maximum enjoyment out of it. · In shipping sometimes the book get a bit flat, just lay it out flat for a couple of days and it will fluff out again. · Your books can be sat on a shelf or wall mounted using a plate display. · Should you wish to dust it, just fan the pages gently, or blow on it. Hi, I'm Joy, book folder, jewellery maker, with traditional values in a very modern format. This is just one of my blogs that is kept to simply book stuff. Enjoy your stay. Share with your friends, send me a comment.